Mesilla Valley Teen Singers: What do you love to sing? Some of the MVTS members ready for the concert. “Christmas, Here & Back Again” is the theme for this year’s free holiday performance by the Mesilla Valley Teen Singers. The popular group will perform Friday, December 11, at 7 p.m. at University Presbyterian Church, 2010 Wisconsin (behind Lorenzo’s and Milagro’s). A free dessert reception follows the performance. The concert is a blend of holiday music traditional and modern, featuring choral songs such as “Carol of the Bells,” “Hush, My Babe,” and “I Wonder as I Wander,” as well as some songs performed by the young men and women separately. The singers are accompanied by pianist Barbara Toth. 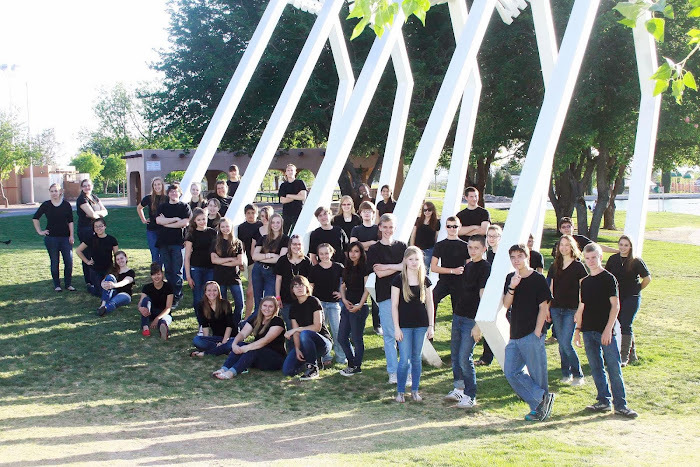 Mesilla Valley Teen Singers has been performing under the direction of Terry Kay Gilbert for over 10 years and presents two concerts each year, spring and winter. The group is made up of over 40 young vocalists from area high schools, as well as home-schooled students. They will begin preparing for their spring concert in January and new singers are always welcome to join. Merry Christmas, Joyeaux Noel: Friday, December 12, at 7 p.m. The Mesilla Valley Teen Singers, a choir made up of young people aged 14 to 19, presents a free concert entitled “Merry Christmas, Joyeaux Noel,” Friday, December 12, at 7 p.m. at University Presbyterian Church, 2010 Wisconsin Avenue, Las Cruces. This talented group of teen singers is now in their 10th year and is directed by Terry Kay Gilbert and accompanied by pianist Barbara Toth. The concert will feature English and French carols of the Christmas season. A free snack reception follows the performance. "Ladies and Gentlemen" is the title of the May 16 concert to be performed by the Mesilla Valley Teen Singers. 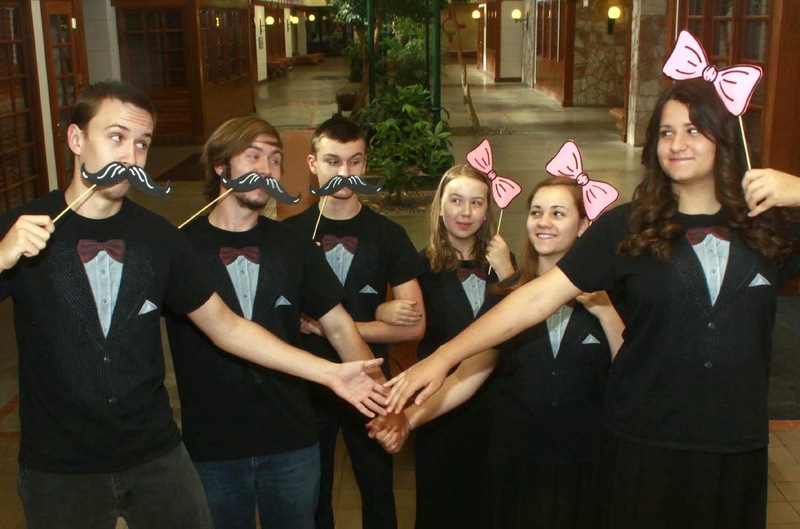 Mesilla Valley Teen Singers, a talented group of about 45 local teens, will perform a spring concert entitled “Ladies and Gentlemen” Friday, April 16, at 8 p.m. at University Presbyterian Church, 2010 Wisconsin Avenue, in Las Cruces. The concert is free and is a family-friendly event. MVTS Director Terry Kay Gilbert has long known that the combined group created beautiful music together. In past concerts, she has also separated the group into males and females for a few of the songs. This concert, however, will focus on the diverse talents of the ladies and the gentlemen in the choir, with selections for the women only, men only and some blending the masculine and feminine voices. The MVTS added an assistant director this year, Christopher Yee, a student teacher at Las Cruces High School. Piano accompaniment is provided by well-known local musician Barbara Toth. The following day, the teen group will perform for Arrowhead Park Early College High School’s first graduation ceremony. Then, they will have a summer break before recruiting new singers for the fall term. Mesilla Valley Teen Singers - ready for their Christmas concert! 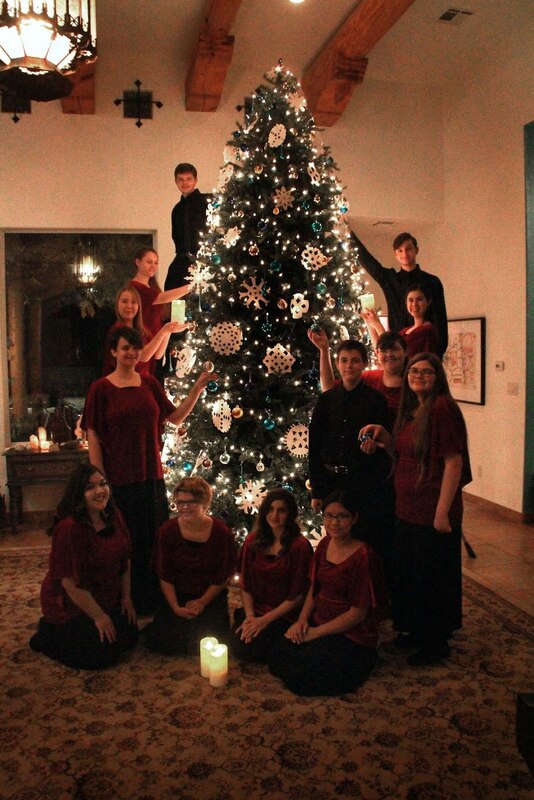 The Mesilla Valley Teen Singers will perform their annual free Christmas concert Friday, December 13, 2013, at 7 p.m.
Mesilla Valley Teen Singers' annual free Christmas concert, "Winter Wind," will be held Friday evening, December 13, at 7 p.m. at University Presbyterian Church. All the pieces which will be performed have something to do with the cold wind that blows through at Christmastime. Shakespeare’s poem "Blow, Blow Thou Winter Wind,” originally from his play "As You Like It,” was the inspiration for the theme. The choir will present no fewer than three different settings of this famous text. Other names well-known in the literary and musical worlds come together here — names like John Rutter, Edgar Allen Poe, and Christina Rossetti — to evoke crisp, frosty images that none-the-less warm hearts with Christmas cheer. Mesilla Valley Teen Singers is made up of about 50 young vocalists from area high schools, as well as home-schooled students. The group is directed by former public school teacher Terry Kay Gilbert. They perform two concerts each year following a full semester of rehearsals. They will begin preparing for their spring concert when the new semester begins and new singers are always welcome to join. A snack reception will follow the concert, to which all are invited. University Presbyterian Church is located at 2010 Wisconsin Ave., behind Lorenzo's Italian Restaurant. This group of talented teens performed Celtic music for their spring 2013 theme. The University Presbyterian Church was packed with music lovers when the Mesilla Valley Teen Singers presented their "A Celtic Circle" concert Friday, May 10, at 7 p.m. This spring's concert featured a wide variety of music with Irish and Scottish origins, from jigs to ballads and folk-lore. The performance earned a standing ovation by the enthusiastic audience. The following week, they reprised the performance for the residents of Golden Mesa, a local retirement community. Directed by Terry Kay Gilbert, Mesilla Valley Teen Singers is a community choir made up of almost 50 teens from schools throughout the area as well as home-schooled students. The group takes a break until the fall semester begins, when recruiting and rehearsals will begin agin. We love to hang out together just as much as we love to sing! When you've got the music in you, you just have to let it out! What do you like to sing? When you’ve got the music inside you, it just has to get out. Teenagers in the Las Cruces area who love to sing have the opportunity to be part of the Mesilla Valley Teen Singers, led by Terry Kay Gilbert. This singing group is not tied to any school and is made up of a mix of teens from local schools and home-schooled students. Terry Kay started the program, which is kicking off its fifth season this fall, to offer more choices to musically-inclined teens. “I wanted to start a group where kids who weren’t plugged in musically would have a place to go,” she explains. Her own children are home-schooled and participate in the chorus. She then led the choir members through some stretching followed by voice exercises. After distributing binders with music, they jumped right into the challenging Handel’s “Hallelujah Chorus,” which will be part of their holiday program. Terry Kay likes to provide a mix of music, so they’ll also learn songs like the ever-popular “Santa Baby,” “Hot Chocolate,” and a variety of classical pieces. The free holiday program will be held in conjunction with the Doña Ana Youth Choir at St. Paul's United Methodist Church on Saturday, December 12, at 3 p.m. Then they’ll start working on their spring concert. Once each semester in order to share the fruits of their labor, they perform at Golden Mesa, a retirement community. “They love it, we love it,” Terry Kay enthused. They have also performed at the Rio Grande Theatre for the Every Other Tuesday free concerts. She adds that since some students are home schooled and others are from a variety of high schools, the members have made friends that they probably wouldn’t have met any other way. Potential members don’t have to audition or even know how to read music. Because Terry Kay has a bachelors degree is music and taught for a number of years in the Las Cruces School District, she structures the program such that the singers will naturally pick up skills as they go along. “I want to expose them to real classical choral music,” she says, working in information on voice, posture, quarter notes and fortissimos along the way. Terry Kay explains that many of the singers in the chorus are “participators,” those who enjoy being part of a group and being involved. Some want another opportunity so sing, even though they are in band or orchestra at school. Since this group only rehearses one day a week, it isn’t a challenging commitment to add to their already busy schedules. The Mesilla Valley Teen Singers is open to anyone aged 14 to 19. The cost is $35 per semester. They practice each week during the regular school semester on Thursday from 4:30 to 5:45 p.m. at Calvary Baptist Church on Locust. 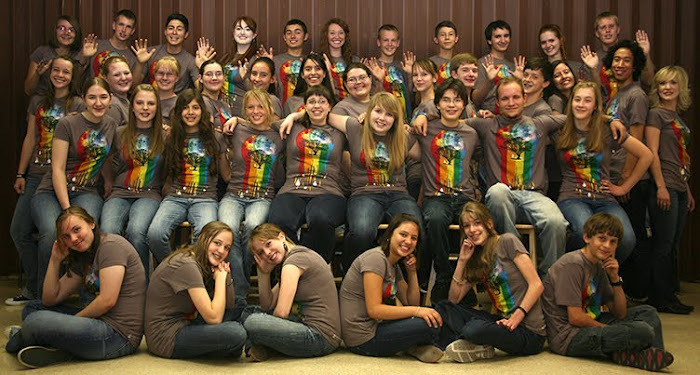 The Mesilla Valley Teen Singers is a chorus located in Las Cruces, New Mexico. It is open to all aspiring singers aged 14 to 19. Come check us out! Sometimes we perform at places like the Rio Grande Theatre, but sometimes we take the show on the road. Here we are performing at Golden Mesa, a retirement community in Las Cruces. The Mesilla Valley Teen Singers is looking for new singers aged 14 to 19 who love music, love to work hard to produce a great product, and have fun while learning. No audition is required. Members will learn about music, master challenging songs, and perform in public. Rehearsals are Tuesdays from 4:15 to 5:45 at Calvary Baptist Church on Locust near Missouri in Las Cruces. The cost is $40 per semester for the first family member and $35 per semester for subsequent family members. Teens who love to sing have the opportunity to be part of a community choir that performs several times a year. 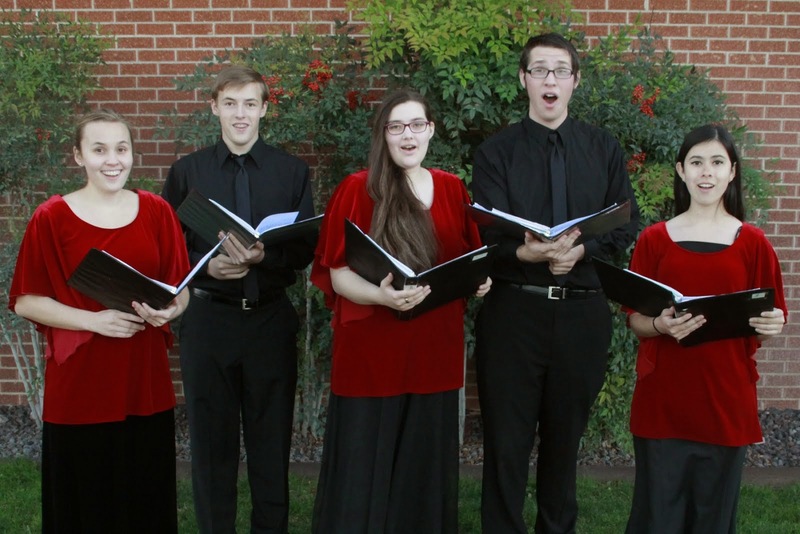 The Mesilla Valley Teen Singers doesn’t require auditions, but participants aged 14 through 19 will have the opportunity to stretch their talents, learn to read music and perform choral music, all while having fun and meeting new people. Terry Kay Gilbert is the director of this group. They meet Tuesdays at 4:15 - 5:45 at Calvary Baptist Church, Locust and Missouri in Las Cruces. Rehearsals for the spring 2012 semester begin January 17. New members are always welcome to join. The chorus is made up of students from many local middle schools, high schools, and NMSU, as well as home-schooled students. 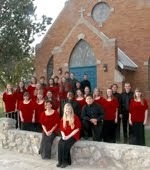 For more information, go to www.mvteensingers.blogspot.com or see Mesilla Valley Teen Singers on Facebook. Terry Kay Gilbert can be reached at (575) 621-8128 for additional details. The cost for participation in the MVTS is $40 per semester for the first family member and $35 for subsequent family members. Want to know more about the Mesilla Valley Teen Singers? E-mail us at mvteensingers@gmail.com. We are a chorus for teens located in the Mesilla Valley (hence the name! ), which is in southern New Mexico. We'd love to meet other teens who love to sing.